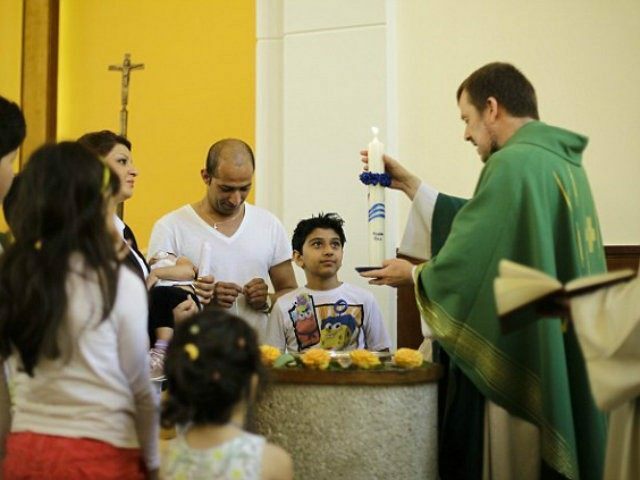 Muslim migrants in Germany are converting to Christianity “in droves” in the hope it will improve their chances of winning asylum. Hundreds of Iranians and Afghanis have been baptised at Trinity Church, a Lutheran church in Berlin, where Pastor Gottfried Martens offers a three-month “crash course” for new converts. AP reports on one baptism where Martens asked Iranian refugee Mohammed Ali Zonoobi: “Will you break away from Satan and his evil deeds? Will you break away from Islam?” To which Zonoobi fervently responded: “Yes”. Martens then baptised him “In the name of the Father, Son and Holy Ghost.” Mohammed renamed himself Martin. Martin Zonoobi, a carpenter from Iran, arrived in Germany with his wife and children five months ago. He is one of many who have converted, with many claiming true belief has prompted them. However, Pastor Martens admits that some convert just to improve their chances of winning asylum in Germany – as Christians who have apostatised from Islam they are likely to suffer heavy persecution if they are sent home. Martens says motive is not important, however. “I know there are – again and again – people coming here because they have some kind of hope regarding their asylum,” he said. Many are so taken by the Christian message that they end up genuinely changing their beliefs anyway, Martens says. He adds that of those who have converted, only around one in ten stop attending church afterwards. Although being Christian alone does not mean they will automatically win asylum – Merkel has even said that Islam “belongs in Germany” – many hope this will be enough to sway authorities. None will openly admit converting just for asylum purposes as it could lead to them being deported as Christian coverts, possibly facing the death penalty when they return home. Martens’s church is now reporting a surge in the congregation from 150 two years ago to more than 600 now. Some of the migrants coming to be converted are travelling from places as far afield as Rostock on the Baltic coast. There no official figures on how many Muslims have converted to Christianity in Germany over the past few years, and the number is still tiny compared to the country’s four million strong Muslim population. Nonetheless, Martens describes the rate of conversions as a “miracle”. He also claims to have at least 80 people, mostly migrants, waiting to be baptised. Zonoobi’s wife Afsaneh, now known as Katarina, said the Christening marks a new beginning. “Now we are free and can be ourselves,” she said.